Perched atop a post outside a house on Victoria Park Road lies a small hut that, from a distance, could be an ornately decorated birdhouse or, less likely, a microwave. But while there’s no food inside, those with an appetite for reading won’t be disappointed, as it holds books, which members of the public can borrow and return without charge. The Little Free Library project is a nationwide initiative though strongly concentrated in East London. Victoria Park Road and Clissold Park are the two Hackney outposts, then there’s Leyton, Leytonstone, Stratford and 12 in Walthamstow, the erstwhile home of the charity’s manager, Nick Cheshire. “We’re looking to promote reading, literacy and art, and a sense of community engagement,” says Cheshire, who founded Little Free Libraries UK with his wife, Rebecca, last year. The libraries are ‘hosted’ by volunteers, who promote them locally and keep an eye on stocks, and they are decorated by local artists wherever possible. One is emblazoned with a handsome red fox, others are inspired by William Morris and Jackson Pollock. Children and families may be the primary focus of the libraries, though Cheshire insists anyone can make use of them. Little Free Libraries originate in the United States, where Cheshire discovered them and was inspired to bring the concept to the UK. Given our increasing reliance on technology, the idea of a Little Free Library seems something more suited to a bygone time. But Cheshire says that the tangibility of books sets them apart from their digital counterparts. Plus many more fantastic artists around the UK. 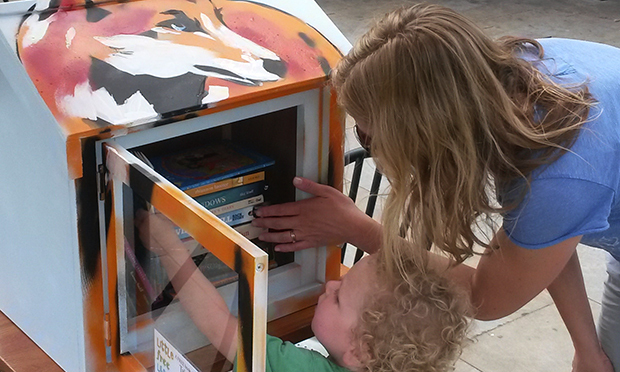 Since installing a network of Little Free Libraries in East London, we’ve gone on to create many more throughout the UK, including, Swindon, Bath, Bristol, Torquay, Ramsgate, Bradford, Birmingham, Essex, Surrey and Sussex. Happy reading!